I've had fun, detailing 3-D printing in previous posts and how that technology will change our lives, just as surely as electronic books, music and movies did. 3-D printing is a big subject, and I keep finding out more. Reading up on 3-D printing, I discovered it was a side discovery related to the micro lithography process used to make microelectronic circuits (computer chips). As a process used to make microelectronic circuits, 3-D printing would lend itself to several dissimilar materials combined together. Micro-circuits consist of wires, different types of silicon, and insulation. Imagine my surprise, when I discovered someone had printed a drone, complete with circuitry. By the way, the drone works. The motors provide motive force, the propellers spin, and the drone flies. Immediately my mind went to how many people talk about Star Trek accurately predicting the future. Even their communicators looked like cell phones of the early 2000s. My mind went to the episode, The Trouble with Tribbles. In that episode, Capt. Kirk gets food from a microwave-like box in the wall with a sliding door. He uses small cartridge to tell the machine what to make for lunch, the door comes up and the machine neatly presents his food on a plate. At the end of the episode, when his ship is overrun with Tribbles, there's a Tribble on the plate rather than food. Today, the Wall Street Journal publishes an article about taste-testing printed food. Seems like future has met science fiction TV. Star Trek shows a working social construct where many of the technology problems we have yet to face are already conquered. Just imagine the day when we can make an iPhone in our household printer. How many people in China will lose their jobs that work for Foxcon, or wherever China produces iPhones? How many people in the supply chain will no longer have anything to do? Looks like a hefty short-term labor surplus. As with any human development, nothing stands still for long. 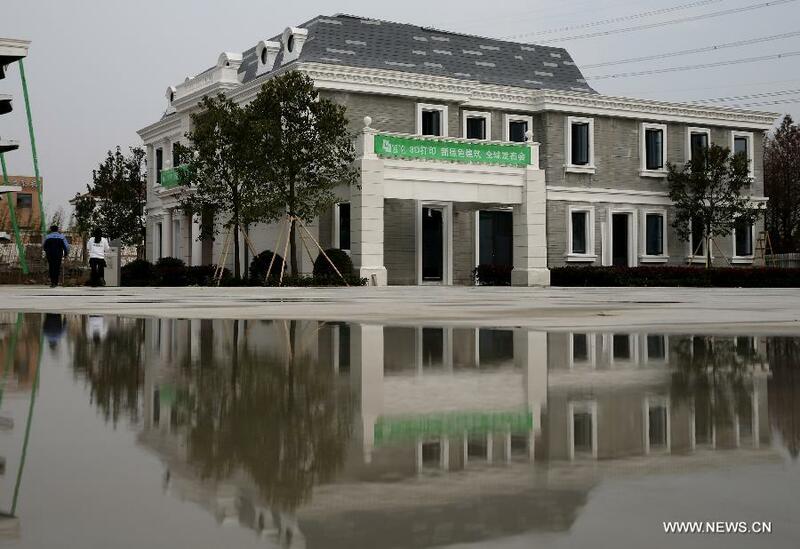 You can get a villa 3-D printed in China, interestingly in Suzhou, part of which comprises the Sino-Singapore Industrial Park. I went to Suzhou in 2009, and only saw birdcage type housing, as they built a city with over 1 million residents from a flat plain surrounding a man-made lake. 3-D printing promises to be a vibrant technology that will replace many other skills and trades. We, as a species, have to learn how to deal socially with this type of raw power. The short-term may look bleak. Eventually, because our species is creative, different types of social constructs will replace the jobs we hold dear in this century. As I write this post, I'm reflecting on what I see as yet another Wind of Change: 3D printing. Bear with me a little while, I'm seeing this as part of several trends that started in the 90s. 35 years ago I went to college. Several people I knew used a cassette tape to capture an LP vinyl record. Everyone knew the cassette tape was the end of the process, because cassettes sounded fuzzy when copied from other cassettes. Some of the cassettes from that era lasted 25+ years if they were good quality. Since the cassettes were the end point of the music, most copying went no further. An average record usually would have under 5 copies made, sometimes just to play in the car by the primary owner. Once we add technology to the mix, more copies were the norm. Napster started, and people were able to share music. Other services in the same general time period were Morpheus, Gnutella, Kazaa, etc. Using the computer and the Internet, people were able to share one CD millions of times, and every copy was the same. Even the record companies took notice. The assault on Intellectual property resulted in record company prosecution of selected individuals. The record company prosecutions (RIAA) resulted in consumer dissatisfaction with the companies. However, they did not stop with consumers, they went after businesses too. In the early 2000s, for the first time ever, music companies such as SESAC, ASCAP, and BMI came by businesses that played music to their customers and demanded contract payments under threat of legal action. One of the ironies of all this enforcement was the complaints from the artists of not getting very much money for their works. The musician complaints crescendo with the introduction of Spotify and Rhapsody which they say don't pay the artist much at all. Additionally, complaining gets musicians banned. The net effect of the hostilities resulted in the slow death of the music industry since the 90's. However, people are consuming music differently now, including ringtones. All in all, the decline is leveling out, but the damage still seems to be done. Movies went through similar problems, but they used different techniques to battle the IP Piracy. Movies went to an early release schedule for DVDs from the theaters, and studios even included regular DVDs with BluRay DVDs. The MPAA sued several people for piracy and general bitterness against the movie studios came to a head with the SONY studios hack. Whether North Korea is behind it or not, someone is pretty upset at them. Still, I'd say people are less upset with the movie studios than the music industry, but you would expect that since the movies took a less combative approach to the problem of piracy. Just like music, people are choosing to enjoy movies in different formats. 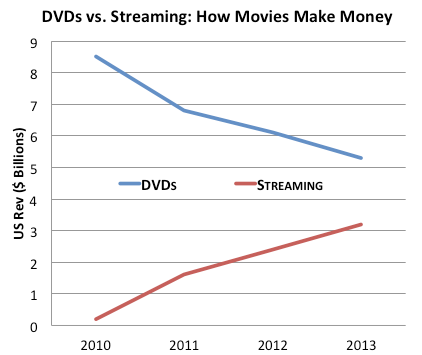 If you add both lines, like 2013 with 5.2 DVDs and 3.2 Streams, you get 8.4, pretty much the same amount as 2010, therefore the market is flat lined. eBooks are the rage for the past few years. In theory, they are cheaper, and easier on the environment. Major problems with eBooks is consumers do not own them, they simply own the right to read them. Forget about leaving your book collection to your descendants, or selling them when you come on hard times. And sometimes they can disappear from you electronic reading device in the middle of the night. I don't hear much about eBook piracy, but it exists. Just like Rhapsody and Spotify, authors complain they don't get enough royalties when they rent a book on Scribd, Oyster or the All you can read Kindle service. On the bright side for authors is the very real probability they can self publish and make decent money. Future printers will make finished goods in metal. This is significant because in the past, very few people would make metal objects at home. 3D printers could change all this. Just think about people making metal guns at home, especially after all the hoopla about the plastic gun made by the plastic 3-D printers. The Military will be able to side step the expensive supply chain insisted on by defense contractors. When they deploy to remote corners of the world, they simply bring printers and raw materials. When they need a plane part, they down load the file and wait while the printer makes the item. The Royal Air Force has already put a printed item on one of their aircraft. The printers are becoming cheaper. Amazon has some for $500 that have fairly decent ratings. At this point, no one really needs one at home, but as prices fall, they will be easier to use and purchase. At this point the inexpensive printers will make plastic pieces that might cost a lot if purchased from a store. Plates, bottles, storage drawers, appliance parts, car parts, the possibilities are endless. The problem with all of these technologies is established businesses trying to apply old fashioned business models to a new process. Suing people, and limiting how people can get the product, never seems to work. Somehow the product still slips out. Books, music and movies all used to be physical products, but they have all changed over to digital delivery. Solid objects are the next item to make the metamorphosis to pure digital form. This is more likely to create change and problems than the previous transitions in books, music and movies. Cory Doctorow, in his novel "Makers", had some idea of all the trouble this transition will make. The last couple of posts are about labor surplus. 3-D printers are likely to create even more problems during their adoption because people will be easily able to copy solid objects, and side step traditional supply chains that include factories, warehouses and thousands of workers. .
And in the copying lies a secondary problem. Who will be motivated to create if they won't be paid? As this Christmas departs into hard winter, I am seeing more and more industries shifting. The overall economic news is good, though. Local news in Portland indicates our economy is getting stronger, even to the degree where arguments over a long derelict area of the city are starting as office workers move into formerly industrial buildings. On a national level, Willard Witte, an emeritus professor of economics at Indiana University's Kelley Business School, predicts a year where we will be breaking out of the slow growth that has plagued us since 2009. Even with these optimistic predictions, Alan Greenspan, former head of the Federal Reserve, went on record saying we still have a sluggish economy. These bright spots in the greater economy indicate that a labor surplus due to technological causes may be alleviated by workers shifting fields, but if Greenspan is correct, we should be thinking about slow growth as a future norm. (You might want to also read The Great Stagnation: How America Ate All the Low-Hanging Fruit of Modern History, Got Sick, and Will (Eventually) Feel Better for a lighter look at this phenomena). These musings lead into the next way to prepare for a labor surplus. Part of your plan B should include being able to shift your plans in the face of a changing environment. If you plan to get into retail as your plan B, consider that retail is showing cracks right now. Perhaps something like technical writing or entertainment could work better. Let's take a quick look at retail. Retail, long considered the place for people to refuge when other industries hit the skids is showing signs of changes. In our local market, Eddie Bauer is closing a store in Lloyd Center. Also in Lloyd Center, but in other places as well, Nordstrom is closing stores. Radio Shack looks to be moving into Chapter 7 January 15th, in a prime example of technological self elimination. Most of Radio Shack's most popular sale items are now carried on a smart cell phone, so the demand is not there, and they failed to respond to people's new shopping patterns. Other retailers having trouble include Aeropostale, Sears, and a perennial favorite, JC Penney. Changes in people's shopping patterns are leading to malls being demolished, or seeing them turn into data centers. This is nothing new, as the Dead Malls web site confirms. Much of the shopping is moving online, with a 15% online shopping increase in 2014. Of course, that 15% increase is also a 10 - 15% decrease for brick and mortar stores. In the future, successful malls and retail centers will have to depend on a mix of entertainment and retail to stay afloat. Some stores use a hybrid approach by allowing customers to order online and pick up in store. WalMart, and Macy's come to mind quickly, but I am sure they are not the only players. If you stay nimble with your plan B, perhaps rather than working retail, you could write catalog entries for retail online operations. Or work in online order fulfillment or customer service. Look for the opportunities and take advantage of them. Most people live in large cities. This is a relatively new phenomena. I went to Las Vegas and discovered my cabbie was an engineer. He accepted a job there designing gambling machines, at a company that went out of business. Other local companies didn't need his skills, and he was flying out to different cities to apply for jobs at great personal cost. If you live in a small metropolitan area, then you may find the opportunities aren't there. Oregon is a state with few company headquarters. This creates a situation where the median salaries are low. I grew up in Connecticut where many companies have headquarters, and we all experienced better pay and opportunities there than in Oregon. Connecticut was also part of the East Coast megalopolis, so we could find jobs easily from Boston to New York City. Also factor in what you do for a career. I'm sure Las Vegas was much better for restaurant and casino workers than it was for an engineer. Above all, stay flexible, there are no hard and fast rules for this. For every piece of advice, an exception always occurs. A successful Professional Engineer, I.B. Storey, started his practice in Charlottetown, PEI, Canada. He now has an office in Florida too, but at the beginning PEI was a remote location with a plane ride to almost anywhere having the large energy consuming facilities his practice depends on. I'm envisioning a return to cottage work conditions similar to British weavers prior to the adoption of large mechanized looms. I think the cottage of the future will center around a work room equipped with a means to communicate at a long distance, printers, 3D printers, office equipment and equipment to make items for barter or sale. The cottage of the future won't be bucolic, though. Most will be in high rise buildings in a dense metropolitan area. The cottage of the future is the end point; the topic of this series of two posts is how to survive the years between now and an emerging new system. Work on your plan B, become as self sufficient as possible, be ready for change and examine where you live. The other day at work, one of my co-workers had a good question. She wanted to know what a person could do to prepare for a labor surplus. Her question was based on the assumption that maturing globalization and practical robotics would lead to a greater labor surplus than exists already. A labor surplus is what happens when many people are available to work any particular job and employers can easily find a person with exactly the correct skills and experience for the position. We have this situation in the US right now, even though the unemployment rate is decreasing. In the long run, everything will work out fine, but the short term adjustment to changes in the labor market brought about by external shocks or disruptive technological innovation can be difficult for individuals. Her question brought on further thought. I took a look in the Internet and found an article on recruiter.com called How to Employ and Cope with Surplus Humans. The article was interesting, although far fetched. Some of the thoughts, like send colonists to Mars, are not possible today. Perhaps Michael Moffa thought he was talking about a theoretical situation, but labor surpluses are starting to effect even China as economic growth there slows. China is off shoring steel production in an atmosphere of slowing domestic consumption. In 2009, I went to Shanghai where my MBA cohort talked to a factory manager who had just returned from scouting potential future locations in Viet Nam. He said Chinese labor was becoming too expensive. If an emerging economy is becoming exposed to labor surpluses brought about by slowing consumption and off shoring production, then the age of labor surpluses is here now and becoming a critical problem. Americans tend to have an earnings life cycle similar to a product life cycle. At the beginning workers don't make very much. 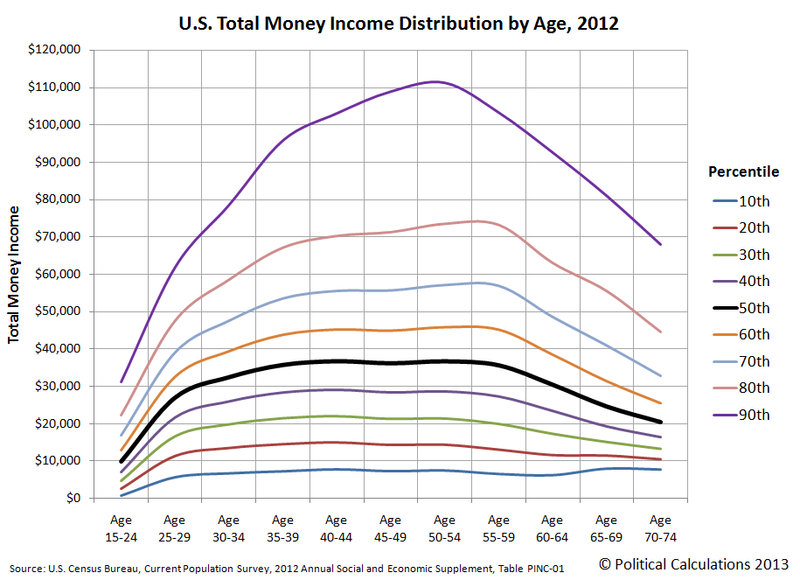 Later in life, they make the most they will in their career, and then as retirement age looms, earnings reduce. As life unfolds, every worker needs to seriously consider what to do when their earnings go down. Age brings on symptoms of labor surplus. Due to this fact, I am writing my list designed on a pragmatic approach to ensure a decent lifestyle in every age and phase. Everyone who has a career needs to keep an eye on trends and developments in their work. Life happens, and sometimes situations don't work out as planned. When a favorite job is lost, or when something happens that is health-based, have a plan B. For me plan B was continue my education so I could have certified skills no one else in my career field possesses. I am ABD (All But Dissertation) for my PhD, and once I get the PhD many possibilities will open to me. I still work as a career manager because I love my job, but I wanted to ensure other doors were open. During my education, I became handicapped, so a PhD makes sense because I can teach sitting down. Examine your skills and desires to discover what your plan B could be. Hobbies can grow into businesses. Cake decorating, bee keeping, E-Bay sales, whatever you do that you enjoy. My wife decorates cakes, and her plan B is to operate a home-based bakery. A friend runs a coffee kiosk in a mall, and his plan B is selling on E-Bay. Others write e-books , consult in their profession, fix computers and operate theme-specific stores. Teaching from home is possible too. There is no one path to success. Make sure your Plan B is something you love so if your career derails, you never go to work again. And if your Plan B is good enough, why wait? Especially if your Plan B is not dependent on one customer, employer, or source of income. Diversification works in stocks and in employment too. Arts and Crafts are not likely to go out of fashion. Everyone can 3D print small plastic items, but can they make a scarf and mittens? Or paint a picture? Not likely, and robots haven't caught on to this yet. Hand knotted Persian Rugs are still an important cottage business in Iran. No factory can make such a high quality item. In Portland, Oregon we have the Saturday Market, but other cities and towns have their own craft fairs. On the Internet, Etsy comes to mind. Cottage industries will be popular in the future, as manufacturing fades and people buy in the long tail market made possible by the Internet. Develop your skills and you will always have something to depend on. I like to watch TV reality shows about Alaska. Many people in Alaska like to live off the grid. This is a difficult life, and probably not something everyone would want. There is still a romanticly appealing notion about being independent of most of our advanced civilization. Still, even for people in cities, there are many skills people can use to increase their self-sufficiency. The quick ones that come to mind are gardening, chicken raising, canning, jam making, sewing, carpentry, auto mechanics, bee keeping, and many others. Anyone can become more self-sufficient which will help if something goes sideways. This is a long post, Part 2 is here.